Movement in exile is very proud to present a world class performance with Sujata Mohapatra, one of the most eminent exponents of in Odissi- East Indian classical dance. A distinguished danseuse of Odissi, Srimati Sujata Mohapatra has made a mark for herself among the present generation of dancers and has won whole-hearted applause from audiences and critics alike. As the disciple and daughter-in-law of the late guru Padmavibhushan Kelucharan Mohapatra, the legendary exponent of Odissi, she inherited his devotion and passion for the classical dance form. Eighteen years of rigorous training under the guidance of her guru eventually molded her into a graceful performer. Her dance is particularly noteworthy for her strict adherence to her guru's style and vision and for her lyrical movements which perfectly epitomize the grace and technical perfection of the Kelucharan Mohapatra gharana/style. Widely traveled over the world as a soloist, Sujata has also been a leading dancer in most of her guru's great choreographies. Movement in exile started as a festival in 2007 and since 2013 operates as a platform promoting contemporary dance and performance art originating in per definition "non western" dance forms. 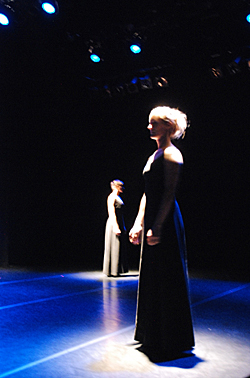 Movement in exile works towards intercultural and international collaborations as well as development of different dance forms in new environments. MIE aims for equality on stage for non- western and western traditional and contemporary dance. The platform produces performances and organises festivals, workshops, performances and seminars focusing on international and national exchange between dancers, choregraphers and organizers. Produced by Farhang förening with support from Swedish Arts Council.